Giovanni Ruffini visits the research group Ancient history, culture and religion and the NeRoNE project in order to give a talk on 'Social Networks in the Ancient World'. Ruffini is Associate Professor of classical studies at Fairfield University, Connecticut, USA. His 2008 monograph Social Networks in Byzantine Egypt was the first full scale study applying Social Network Analysis on the ancient world. 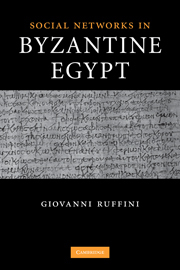 In addition to revisiting his study of Byzantine Egypt in light of later work, Ruffini will also discuss the advantages and limitations of applying network perspectives to ancient history. Venue: Seminarrom 1, Øysteinsgate 3.